As part of Martha’s book tour, she will participate in radio interviews. You can find some of her interviews below. Martha Lemasters appeared on “Talk of the Town” a public affairs talk show. She was interviewed by veteran journalist Marcia Littlejohn. The show is heard at various times over Treasure and Space Coast Radio stations. Martha discusses her experience working on the Apollo program during the great space race. She talks about what it was like being a working woman in the 1960s and women’s equality, and what it felt like to be a woman working at the Kennedy Space Center at a time when men outnumbered woman 200 to 1. She also reveals the true meaning by the title for her memoir, The Step. Martha was interviewed on May 3rd by Laura Steward for her show It’s all About the Questions which airs on WAXE 1370 am/107.9 FM and iHeart Radio. 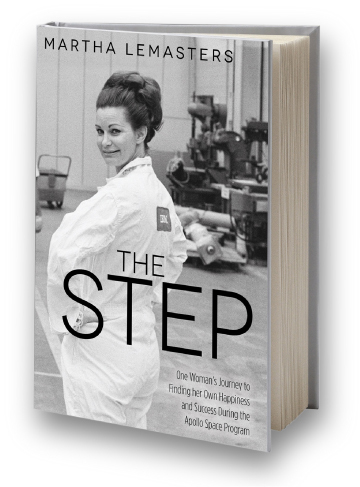 They talk about Martha’s experience working on the Apollo program. The challenges she faced as a single mother working in a male dominated environment, women’s equality and how womens’ roles have changed. Martha also shares how she steers clear of negative thinking and describes the power of positive thinking. Click here to hear or read the interview. Martha was interviewed by Rhett Palmer on Tuesday, April 5th. The interview aired on WAXEiheart radio on 107.9 FM and 1370 am. They discuss the Apollo program, what it was like to be a woman working in a man’s world, women’s equality, divorce, etc.